Toil away on BP’s Transaction Analysis beat long enough and you start to get a feel for the tides. There’s a certain ebb and flow in the way styles of players drift from team to team—which guys tend to find their way through waivers, which bench bats are most likely to bop from harbor to harbor. Certain franchises keep churning to find the right mix of guys on the come-up or past-their-prime vets in need of one more shot. And for the most part, players who tend to end up on more than a fistful of teams are of a certain stripe: just-a-hair-above-replacement utility bats and relief pitchers. That is, at least in part, why Octavio Dotel is the worldwide leader in MLB teams played for (with 13) and Matt Stairs is his position-player counterpart (with 12). These are players who fit a niche that nearly every team tries to fill: you can never have enough competent relief pitchers, and you can never have enough power off the bench. But while Dotel and Stairs were good, they rarely really fell under the umbrella of “great.” So let’s try a different view, shall we? Let’s examine the players who suited up for many, many teams and pluck out the best of them. Can we find any patterns in their movements, any styles that seem en vogue, or any ties that bind together the greats who never found a regular home? Who knows? But let’s look at some tables! 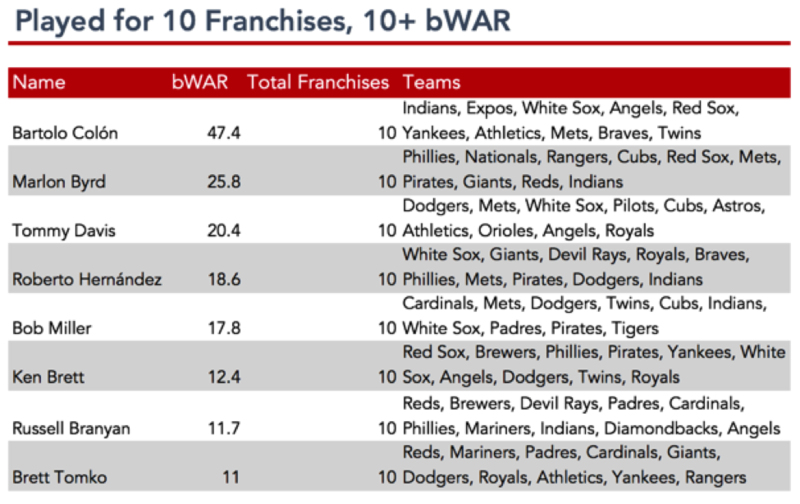 I’ll begin by scooping up every player who suited up for 11 or more franchises and earned 10 or more bWAR over their careers. It’s a relatively short list, headlined by a couple of names I’ve already discussed. Yes, there’s the aforementioned Dotel and Stairs. 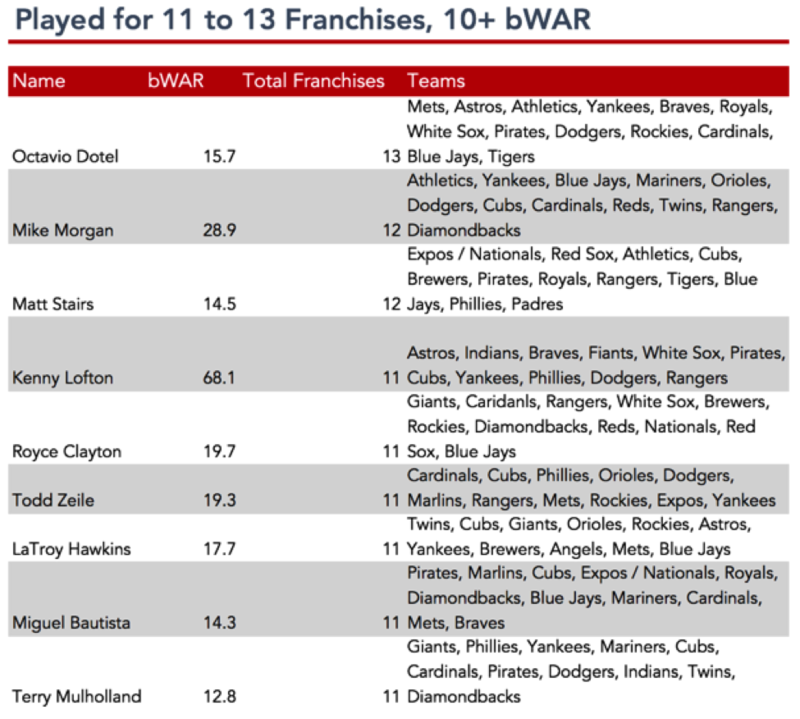 But one name—and bWAR total—should jump out at you here: Kenny Lofton. Lofton was an unbelievable talent and a borderline Hall of Famer; his case is made briefly but convincingly in Jay Jaffe's The Cooperstown Casebook. Despite being a world-class leadoff hitter, recognized at the time as a special talent, and playing for the Indians for 10 seasons of his career, Lofton still found himself bouncing to 10 other teams before he called it quits. He was never run out of town for a bad attitude (that I know of) and wasn’t the type of player who had to change teams in order to reinvent himself or jumpstart his performance. Yet he was still the very rare example of a world-class player who didn’t stick with a team for very long at all once he reached the second half of his career. There are some other fun names, but it's mostly average or below-average regulars able to hang on for a long time. Very few good or great players end up toiling for so many teams, with Lofton (and Morgan) as the notable exceptions. What caused these players to move around so much? In Lofton’s case, though he spent much of the early part of his career with Cleveland, his willingness to accept short-term contracts in pursuit of a World Series created a situation in which many teams could vie for his services. At the same time, his skill set wasn’t easily replicated and the lack of a long-term salary commitment made him a desirable trade target. In the case of Morgan, perhaps it was the stretches of ineffectiveness that plagued him early in his career, combined with an ERA that never quite reflected how effective he could be. He was also traded four times (and claimed in the Rule 5 draft once) just in the 80s, preventing him from having a powerful connection to a single franchise. Here we have another set of middling players punctuated by one strong outlier: Bartolo Colon. Colon is still playing, meaning there’s a non-zero chance that he adds another team to his tally. Until then, he’s clearly the greatest player to play for an even 10 franchises. Colon’s Cy Young award and four All-Star selections trump Tommy Davis’ two batting titles and three All-Star selections, as well as Marlon Byrd’s lone All-Star appearance. Colon’s career trajectory is likely what made him such a rarity as an excellent 10-teamer; his run was effectively done after his second stint with the White Sox in 2009, and it seemed unlikely that he’d return to the majors. Since then, Colon has been something of a mercenary starting pitcher and healthy (#cantpredictball), even as teams have been reticent to offer him a long-term contract due to his age and previous history of arm issues. Davis, meanwhile, hung on for several years after a catastrophic leg injury. Teams tried to get some use out of his talented bat, but they ended up signing on a replacement-level player for most of his career after he left the Dodgers. It was likely his potential, and his willingness to keep at it, that made teams want to acquire him even past his prime. Byrd, meanwhile, found late life as a power bat off the bench, but his vacillating performance seemed to leave teams eager to move on quickly. Also, steroids. Starters-turned-relievers. They move around a lot! Next, there are two very good starting pitchers who still managed to find their way to nine teams: David Wells and Bobo Newsom. Both of them had what one might call “colorful” personalities, if we’re being charitable. Wells was a force of nature on and off the field, known as much for his diet and lifestyle as his ability to mow down hitters. 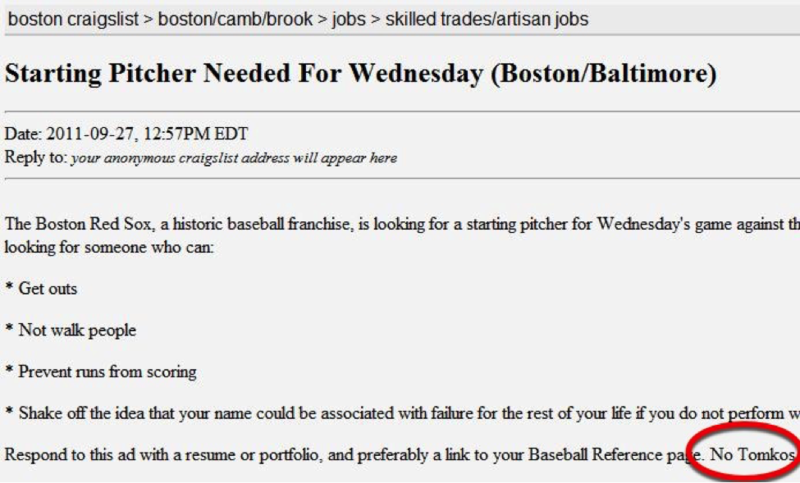 That’s a shame—Wells is one of the best left-handed pitchers of all time, particularly if you’re into DRA. At his peak, which came in his late 30s, he posted ERAs that may seem kind of middling, hovering in the high 3.00s and low 4.00s. However, given his typical environments (Yankee Stadium and the SkyDome) and the league at the time, DRA sees many of these seasons as worthy of between five and eight WARP. Wells’ late start—he wasn’t a regular until he was 27—also likely led to his inability to find a regular home, and perhaps more so than his reputation. Newsom was also a character, frequently talking about himself in the third person long before Henderson (or Dwayne Johnson) made it kind of cool. He had the reputation of a straight shooter, running his mouth and speaking frankly no matter what the situation, and this led to multiple clashes with teammates, managers, and ownership. One of the lone players to hit lists like this before the advent of free agency, Bobo was traded five times, Rule 5 drafted (yes, they had that back in the 1930s) twice, and purchased by teams five more times. Incredibly, Bobo didn’t even pitch in the majors for five seasons between the start and end of his career, which ran from 1929 to 1953. During that time he was a five-time All-Star and appeared on MVP ballots in six seasons, but never stuck with an MLB team for more than three seasons in a row. (He also often pitched for poor-performing franchises, from his early games with the Brooklyn Robins to years with the St. Louis Browns, Washington Senators, and Philadelphia Athletics. Then there are the two Hall of Fame relief pitchers: Hoyt Wilhelm and Goose Gossage. Wilhelm, one of baseball’s first relief aces, only entered the majors when he was 29, and pitched through his age-49 season. Perhaps it was the combination of his age, his signature pitch (a hard-to-receive knuckleball), and his then-undervalued role as a relief pitcher, but Wilhelm was traded five times, let go to another team on waivers three times, released once, and even once picked up in an expansion draft. Here we have another no-doubt Hall of Famer, and another legend where the story isn’t always about how talented they were. Gaylord Perry is most famous for doctoring baseballs on his way to Cooperstown, which may have helped his numbers but undoubtedly harmed his legacy. His performance is unquestioned today—any of the WAR-based metrics give him incredible credit for his peak and his longevity—but during his salad years there was quite a bit of focus on how many games he lost over the course of his career. Like Lofton, he spent much of his early career with the same team, but once he entered the 70s, Perry started making appearances for several franchises. He retained his effectiveness well into his 40s, including a Cy Young Award at 39 and an All-Star appearance at 40. Next up, there are two incredibly athletic and powerful outfielders in Gary Sheffield and Bobby Bonds (and two more later in Mike Cameron and Steve Finley). Sheffield is a borderline Hall of Famer on the strength of his 509 career homers and long career of offensive success. Bonds was one of the first power/speed combo hitters, becoming a five-time member of the 30/30 club. Sheffield had a bit of a reputation for volatility during his career, and ended up being traded several times during his first decade in baseball. Bonds, meanwhile, spent much of his early years with the Giants before six trades in the span of about six years. When looking at these players in the aggregate, it appears that there seem to be a disproportionate number of center fielders and leadoff hitters among the position players. Only one catcher snuck in here (Benito Santiago) and two middle infielders (Royce Clayton and Julio Franco), plus whatever Zeile counts as. Of course, relief pitchers are to be expected, but I was surprised at the number of competent starting pitchers who made the above lists, including guys like Danny Darwin and Livan Hernandez. Some of the players included were outspoken or larger-than-life personalities like Henderson and Newsom, but others were consummate professionals like Lofton and Morgan. I’m not certain that personality played a dramatic part in the shifting of teams in this sample, though it certainly might’ve in particular cases such as Sheffield’s trade away from the Dodgers or Newsom’s feud with Tigers GM Jack Zeller. I’ll also throw something else out here: does it seem to you that maybe the position players on this list are disproportionately African-American? I mean, I couldn’t help but notice that of the 14 position players, eight are African-American and one (Julio Franco) is a Dominican-born player of African heritage. Lofton, Henderson, Bonds, and Cameron all fit into that “speedy leadoff-hitting outfielder” mold. Is there any chance at all that this could factor into teams’ willingness to part with these players? I don’t know, but perhaps this is a thread that could be examined in the future. When you start to drop down to the six- and seven-team players, there’s plenty more top-tier talent to be found; you have Randy Johnson and Tim Raines (six teams), or Carlos Beltran and Waite Hoyt (seven teams), and many, many more. If you’re interested in all the data I’ve pulled on the best players who played for six or more teams, you can look at it here. I’m not confident that there are many world-shaking takeaways here, but I do find it interesting that a handful of the greatest players in history would find themselves playing for so many franchises. Recently, it seems as if more and more players fail to spend their entire careers with a single team, but many of the game’s greatest limit their appearances to a number of teams you can count on a single hand. In the cases of a precious few, gems such as Kenny Lofton and David Wells get lumped in with journeyman-caliber players such as Jeff Fassero and Roberto Hernandez, a fact that never ceases to amaze me. 6 comments have been left for this article. N is for Newsom, Bobo's own favorite kin. When asked how he got here, he talked his way in. Anyway, with a lot of these players, you can ask why they were let go, but it's just as important to note that there were always other teams who wanted them. I may not be looking to get rid of a player, but if the right offer comes along, especially if I have a Plan B (or if the deal includes plan B at that position), I make the deal and a fine player gets a new wardrobe. Don't forget that Finley was a Padre too! 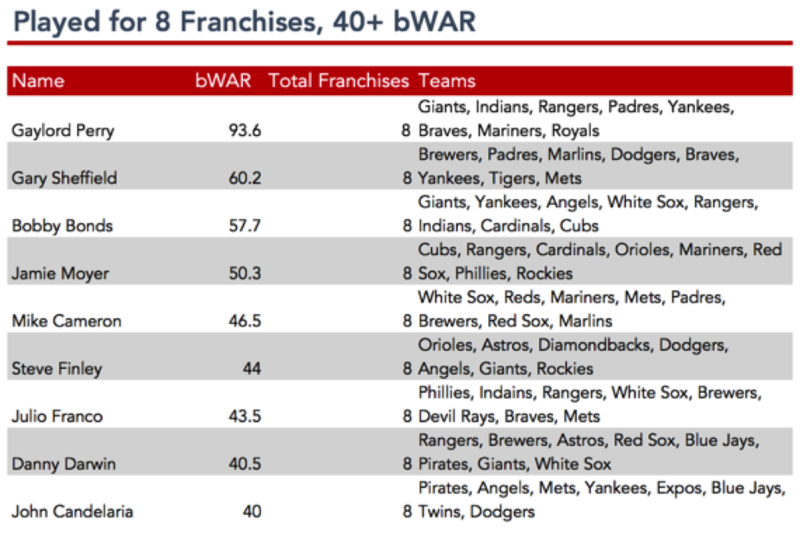 You list 8 franchises but omitted San Diego from the list. No love for the Friars. My hatred for the Padres is only eclipsed by the loathing I have (via secret dig) for San Francisco in Kenny Lofton's table. One player I had a soft spot for seemed to just miss the cut: Reggie Sanders. Valuable part of real and fantasy baseball teams. With 39.7 bWAR, he quite literally just missed the cut for the eight-team guys. He's a weird one for me, as I always remember him as a Padre despite him only spending the '99 season with the team. 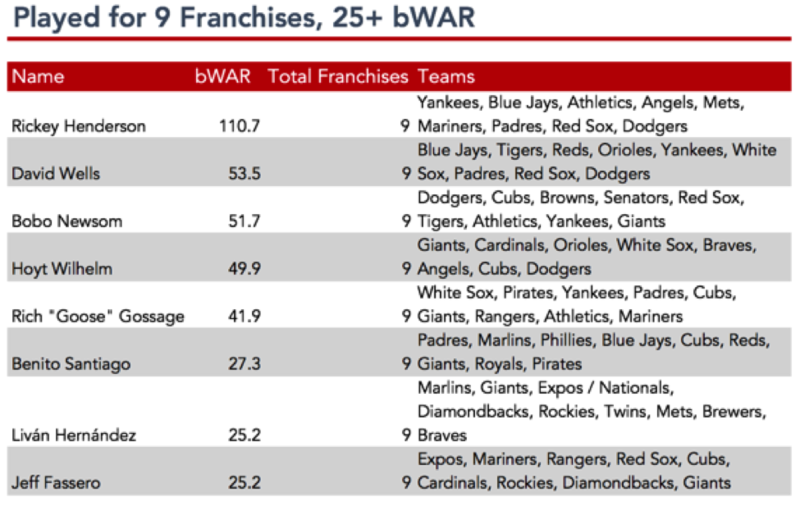 Just counting number of franchises played for sort of discounts how well-traveled some of those guys were, like Rickey Henderson and Bobo Newsome. They each played for certain organizations 3 or 4 different times. If you consider each of those, Rickey has about 5 more teams and Bobo about 10 more teams! 2017-08-15 - DFA Podcast: Ep. 23: That's Clippie!